Here is a letter that I wish Serena Williams, as a leader, would write to the tennis world. 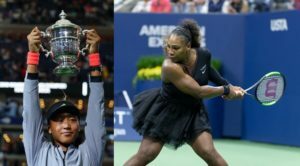 US Open Winner Naomi Osaka and Serena Williams (photos: Lev Radin and Leonard Zhukovsky, Shutterstock.com). Naomi Osaka beat me in the US Open finals with her shots and her poise, and I’m looking forward to watching her evolve as a champion—even as I do some more growing myself. Since the final, many observers have offered their views of the match itself and, of course, its complications, ranging from criticism or support of me to appropriate praise of Naomi. It’s time I weighed in myself. Three things are important here: Naomi’s win, my actions, and women’s tennis. First: Naomi won the match with her game and her maturity. The best example of both was her serve on her second match point—a hard, wide angle that I couldn’t reach—delivered after a lot of noise that would’ve unsettled a lesser player. Anyone who second-guesses Naomi’s victory hasn’t played a Grand Slam final. Second: I went over the line with my protests, and I apologize. I’m sorry they distracted fans (even for a second) from the importance of Naomi’s first Grand Slam. I didn’t recognize this in the middle of things, when all my focus was on the match and the score. But when the fans continued booing into the awards ceremony I realized I should’ve let it go sooner. I tried to calm things a bit, but the damage was done already. A few more days’ perspective has only added to that sense. Don’t get me wrong; I hate to lose and I really wanted this one—to tie the Slam record, to win it for my daughter … for many reasons. It’s true that I want to keep speaking out for women, and address biases big and small. But in those heated moments my focus was much, much narrower. If my daughter were in Naomi’s shoes that day, I would have hoped for a bit more grace from her opponent. Third: Women’s tennis is much bigger than me. I owe it a lot. I hope I’ve given it a lot, too, and I plan to continue—by playing, by speaking, by striving to be a leader and a role model for my daughter and for girls and young women everywhere. That’s where the growing comes in—I’ve got more of that to do and I’m glad my journey’s not done. Women’s tennis has come a long way since the open era began 50 years ago—in equal prize money, of course, but also in many more subtle ways. For example, decades ago we might’ve been happy to imagine a day when the sport’s most experienced and respected umpires would be calling both men’s and women’s matches—umpires like Carlos Ramos, who for years has expertly served men’s and women’s tennis at the highest levels, and who deserves our respect even when we disagree. I have more work to do, on the court and off: more titles to pursue, more perspective to gain. I plan to do both. I look forward to more chances to compete, to chase records, to evolve women’s tennis and to challenge old thinking—unapologetically. For now, though, the important thing is to get past the distractions I created last week at the US Open, and to celebrate a new champion and a great role model: Naomi Osaka. Also who liked it is my daughter, Kim Lehman and a Robert Fisher, who played #1 for Largo High in 1972 and is now a tennis pro in Philadelphia. Excellent Mike! I know I wouldn’t have been so eloquent would have probably mentioned the incedent several years ago with Serena screaming in the face of that little Asian Line person ready to kill. But, then again you were always the wiser.